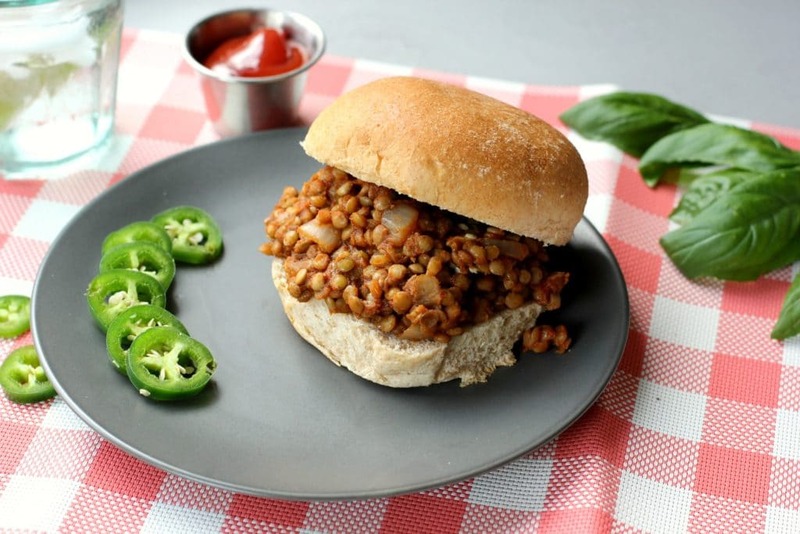 These vegan lentil sloppy joes are a healthy twist on a classic! 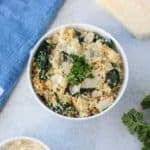 They’re loaded with 16g of plant based protein and they can be made with simple pantry staples. You’re going to need some extra napkins for this recipe, but it’s worth it. 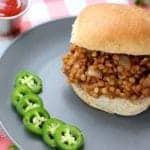 These vegan sloppy joes are just as good as the messy sandwiches you remember from childhood, but they’re a whole lot healthier! I’ve been on such a lentil kick lately. They’re so versatile. It’s fun coming up with new ways to use these little powerhouse legumes. I always have a bag of lentils in my pantry because they’re such a cheap and easy protein. You can typically find them in the natural food section of the grocery store or near the bags of dried beans. Lentils are a good source of iron and they also contain a lot of fiber, which helps regulate blood sugar and keeps you full! 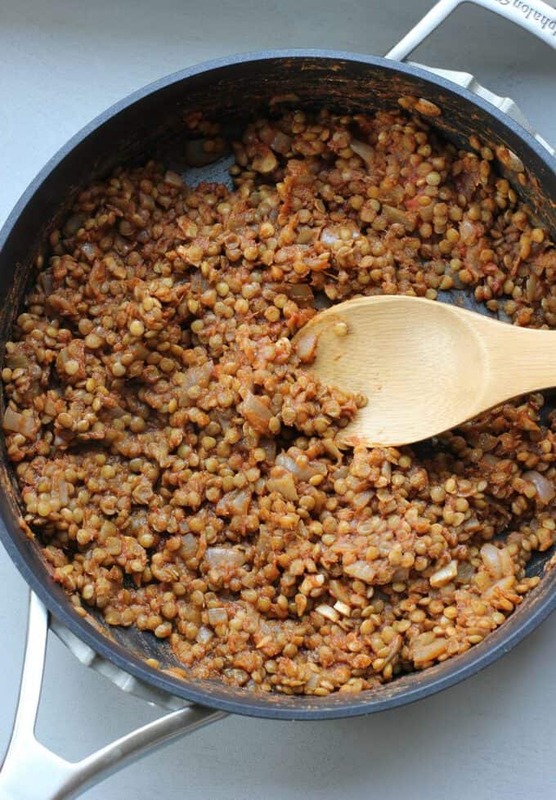 Green or brown lentils work best for this recipe as red lentils are a little too soft. Grab a bag the next time you’re at the store and try these! In a large skillet, add the olive oil, onion, and garlic. Cook over medium heat for 3 minutes, stirring occasionally. Add the paprika, chili, cumin, and salt and stir to combine. Continue to cook for 2 minutes over medium heat. Add the lentils and water and bring to a boil. Once boiling, reduce to a simmer and simmer for 25-30 minutes until the water has been absorbed and the lentils have softened. It’s ok if the lentils are still a tiny bit firm. In a small dish, whisk together the ketchup, maple syrup, apple cider vinegar, soy sauce, and tomato paste. Continue cooking over low heat and add the mixture to the lentils. Stir until it’s well coated and the lentils have completely cooked. 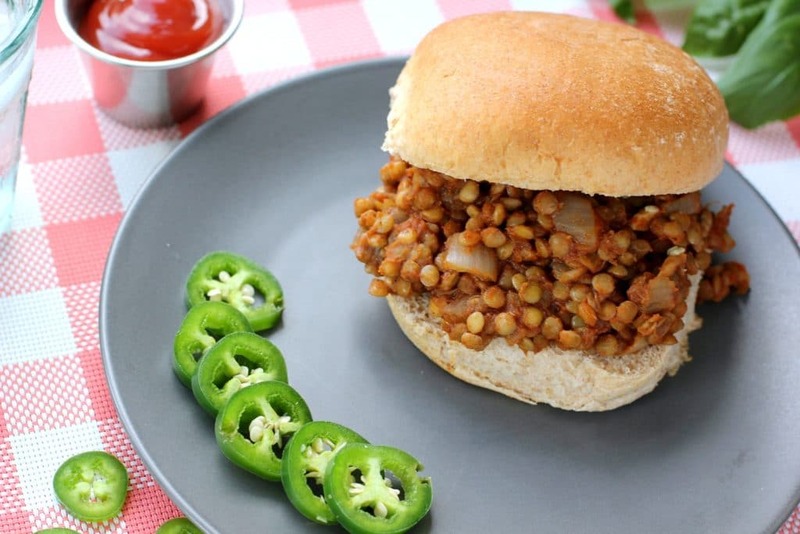 Divide the lentils on to each bun and add jalapeno, hot sauce, or any other burger toppings you like! 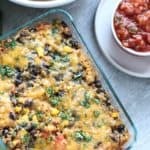 Note: This recipe can be made ahead of time and reheated in a skillet or microwave just before serving. The sauce is deliciously tangy and sweet thanks to the combination of the apple cider vinegar and the maple syrup. Obviously, if you didn’t want to make your own sauce, you could follow steps 1-6 then add your own barbecue sauce. But keep an eye on the ingredients list. A lot of barbecue sauce isn’t much more than high fructose corn syrup and caramel coloring. Making your own only takes a few minutes and it’s delicious! I could also see these lentils being delicious in a lettuce wrap or on top of a chopped salad! Extra lentils? 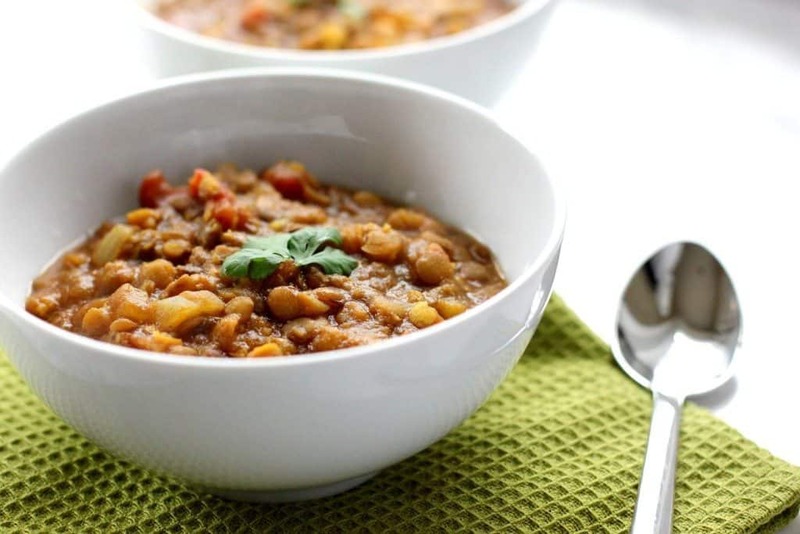 Try these vegan curried lentils! They’re delicious reheated, making them a perfect lunch option. What’s your favorite childhood classic? I’ve been loving lentils lately, too! BTW, I *love* your new cookbook. 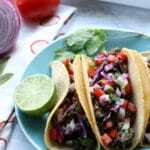 You make eating vegetarian meals look so much much simpler than one may think and tasty, too! I also like that you don’t use faux or processed ingredients. I’ll let you know which recipes I try. This actually sounds better than the meat version to me! Gonna have to try this one out! 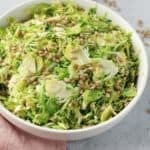 I’ve been cooking with lentils this summer – this looks like the perfect addition to our summer menu! 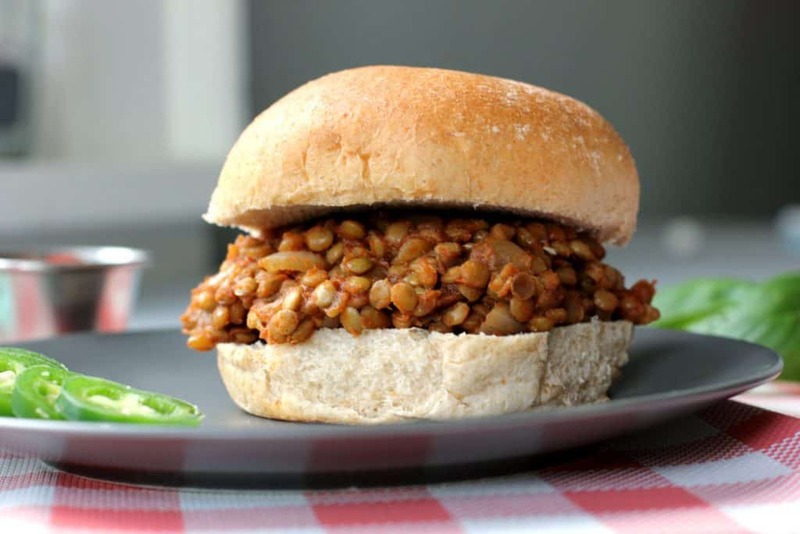 Great idea to make sloppy joes with lentils! Ummm these looks SO savory! Cannot wait to try as a healthy alternative to our usual! Thank you for such a delicious idea. Yum. I really like sloppy joes and these look really good. I’d never thought of using lentils!